When ice on land slides into the ocean, it displaces ocean water and causes sea level to rise. People believe that when this floating ice melts, water level doesn’t rise an additional amount because the freshwater ice displaces the same volume of water as it would contribute once it melts. Similarly, people also think that when ocean water freezes to form sea ice and then melts, the water is merely going through a change of state, so it won’t affect sea level. However, in a visit to NSIDC in May, Dr. Peter Noerdlinger, a professor at St. Mary’s University in Nova Scotia, Canada, suggested otherwise. In a paper titled "The Melting of Floating Ice will Raise the Ocean Level" submitted to Geophysical Journal International, Noerdlinger demonstrates that melt water from sea ice and floating ice shelves could add 2.6% more water to the ocean than the water displaced by the ice, or the equivalent of approximately 4 centimeters (1.57 inches) of sea-level rise. The common misconception that floating ice won’t increase sea level when it melts occurs because the difference in density between fresh water and salt water is not taken into consideration. Archimedes’ Principle states that an object immersed in a fluid is buoyed up by a force equal to the weight of the fluid it displaces. 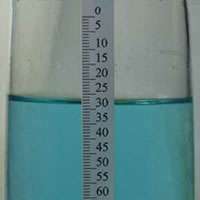 However, Noerdlinger notes that because freshwater is not as dense as saltwater, freshwater actually has greater volume than an equivalent weight of saltwater. Thus, when freshwater ice melts in the ocean, it contributes a greater volume of melt water than it originally displaced. 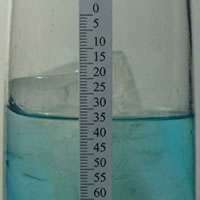 Figure 1: A freshwater ice cube floats in a beaker of concentrated saltwater. Note that the ice cube floats much higher in the saltwater than it would in a glass of freshwater because saltwater has a greater density. Figure 2: When the freshwater ice melts, it raises the water level. Freshwater is not as dense as saltwater; so the floating ice cube displaced less volume than it contributed once it melted. Noerdlinger's collaborator, Professor Kay R. Brower, of the New Mexico Institute of Technology, Socorro, validated the effect experimentally as seen in Figures 1 and 2.